Background: Heart failure is a deadly epidemic with over 37 million people affected worldwide with a multitude of physical, psychological and financial implications on patients and the healthcare system. The progression of heart failure can be prevented by appropriate and persistent medication therapy however previous research has estimated forty to sixty percent of patients with heart failure are non-adherent with medications. At Northwestern Memorial Hospital, our initial studies show that fifty-seven percent of patients discharged with heart failure are taking at least one cardiac medication incorrectly 48 hours after discharge. Since previous studies have proven that medical therapy is effective we hypothesized that improving the rate of medication adherence can improve heart failure quality and outcomes. Purpose: Our goal was to increase the rate of cardiac discharge medication adherence from forty-three percent to seventy-five percent. Description: In order to identify barriers to medication adherence, we identified patients’ perception of barriers by interviewing patients who had been readmitted with heart failure. We discovered that patients found discharge instructions hard to understand, lacked knowledge about medications, and felt the regimen was too complex. We created a process map to find where errors can occur and where we could possibly intervene. We targeted multidisciplinary interventions to one cardiac unit and two hospitalist general medicine units. Our main intervention was the creation of an easy-to-read medication chart rather than the standard medication list. Pharmacists then used this chart to explain to patients what their medications were, when to take them, and their purpose including side effects and potential drug interactions. We also had increased heart failure teaching from our dedicated heart failure nurse educator. 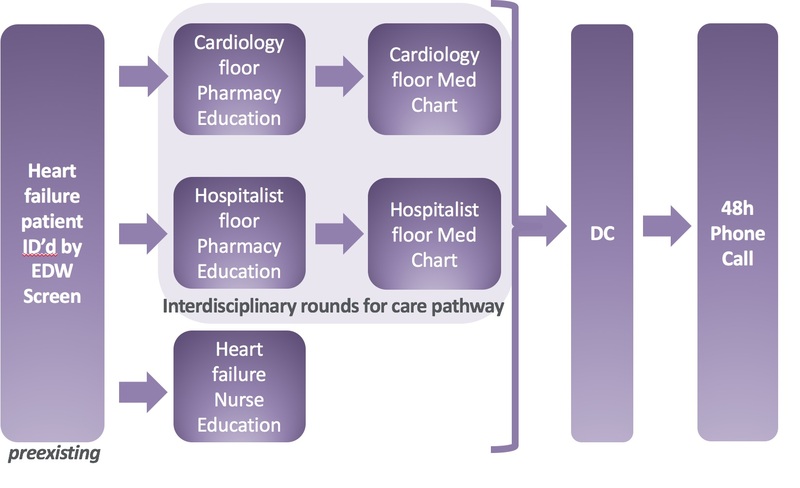 We created a care pathway for interdisciplinary rounds that included key orders such as daily standing weights, strict input/outputs and dietary restrictions that we felt all heart failure patients should have in order to help standardize care across multiple hospital units and care teams. In order to ascertain discharge medication adherence, pharmacists from the cardiology clinic completed discharge phone calls 48-hours after discharge from the hospital. At that time, they have the patient review their medication bottles and explain when and how to take them. Their responses are compared to the medication chart and medication reconciliation done at discharge. If any discrepancies are found, the pharmacists note them and educate the patient on the correct response. 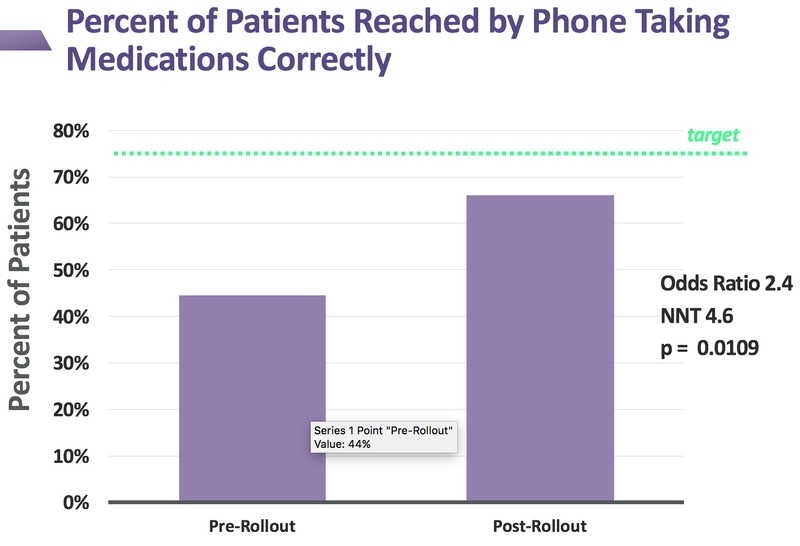 After the rollout of our combinations of interventions, we were able to increase the percentage of patients taking their medications correctly from forty-three percent to sixty-six percent in the span of less than one year. This represents a moderate effect size (odds ratio of 2.4) and was statistically significant by Student’s t-test. Conclusions: We found the multidisciplinary teams can effectively tackle large problems such as adherence to discharge medications. We have expanded the process to all hospitalized heart failure patients in our facility and are expanding to include the entire hospital system. We plan to fully evaluate the effect on outcomes and readmissions with a larger sample size. We would also like to expand the above interventions to other high-risk conditions. Astik, G; Defoe, M; Youmans, Q; Cheema, B; Gay, H; Sandison, K; Fine, M; Vander Ploeg, S; Vlcek, A; Mutharasan, R. Improving Adherence to Discharge Medications for Hospitalized Heart Failure Patients. Abstract published at Hospital Medicine 2018; April 8-11; Orlando, Fla. Abstract 211. https://www.shmabstracts.com/abstract/improving-adherence-to-discharge-medications-for-hospitalized-heart-failure-patients/. Accessed April 25, 2019.